I recently came across these photographs that my parents had wrapped in tracing paper and obviously protected over the past 60 years.The first shows the Coronation Window itself. 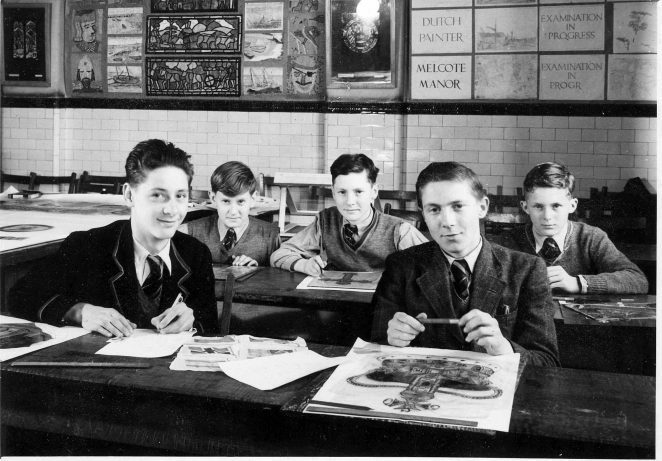 The second shows some of the art class working on the project for the window in 1952. Front row is Ian Waddell (left) and Joe Osbourne. Behind is Alan Burt (left), Alan Woodart and me, Barry Flahey. If memory serves, the Coronation window was initiated by Mr Alex McKinley following the success of the Festival of Britain window. It certainly was a major project and many students who opted to take art classes did a little bit toward completing the final window. I do not remember if it was ever put on display and have no idea what eventually happened to it. I am still working in the arts field , drawing and painting insects and plants for the Canadian Agrifood research dept. I think it is largely due to Mr Alex McKinley and his teaching at the Brighton Building School for Building and Engineering that I went on to forge a career in the arts. Do you remember the Coronation Window? Maybe you worked on it? Do you remember Mr McKinley? If you can share your memories with us, please leave a comment below. Front row is Ian Waddell (left) and Joe Osbourne. Behind is Alan Burt (left), Alan Woodart and me, Barry Flahey. There is a thread in this website about the Building School and also about the window. From memory I think the whereabouts of the window is given. There is more than one thread about the BSTSBE by the way. I suggest trying the search box. Editor’s note: Vic – if you look at the top of the page on the right hand side it shows all the pages about the school. It includes one about the Festival of Britain stained glass window. ‘Tug’ – I recall you readily - and indeed Joe Osbourne and Waddell - especially on the soccer field. I never aspired to anything art in those days and so was kept well clear of the window. Today though I would have loved to be involved. Hope life has been kind to you all. Opps, forgot to add the link, open to all ex-pupils of course. I’m John Snelling and I was in Classes 3x, 4x & 5x between 1951 -1954. People in my class were a big ginger haired lad surname Pearce. Another “Giant” called Dave Short. Some of the staff included “Goofy Downing the Headmaster, Mr Chappell, Tech drawing. Mr Parfitt, Plumbing, Mr Taylor Carpentry. Mr Weedle, PE and games (we used to use Patcham School Field for games and later East Brighton Park). Mr Hargreaves, Brickwork, Mr Hoddart, Geography. Then came M Behar French (who took us to see french films at the old Continental cinema in Sudely Place). I recall “M Hulot’s Holiday” and “The Green Mare’s Nest” also “Clochmerle”. I recall Mr Mckinley’s “Stained Glass Window” and we used to make pictures out of Black card and coloured cellophane. Did you know that McKinley actually designed a £100 note for the show “Zip Goes A Million” starring George Formby which I saw in London c 1953 where his “note” was distributed to the audience entering the theatre. What a terrible building the BSSB&E was, and I trust it was pulled down as it was built in 1888! I suspect that all if not most of the staff have gone as I will be 80 in April 2018. I would love to hear any comments you may have. John Snelling. Who was in the BSTC 1954 Rugby Team?